Greenroyd enters 15 various mixed, ladies only and men only teams in five different local leagues. These cater for different levels of ability and most emphasise participation and enjoyment rather than competition and winning. Commencing in 2017 and completing in Feb 2018, the club house was completely redecorated and a conservatory added to the RHS frontage of the club (photo across). The President (Vaughan Murgatroyd) officially re-opened the club on the10th of February 2018. The President can be seen cutting the ribbon (photo below left) and the members can be seen toasting the re-opening (photo below right). In order to commemorate the centenary year the club put up a clock above the clubhouse with funds raised through the weekly prize draw. On 25th May 2009 the unveiling ceremony took place. In February 2006 the then President , John Ingham, initiated major changes to the clubhouse in four phases, which were completed in the Centenary Year. New foyer / entranceway at the South end of the club. Complete renovation of the Gents toilets. Creation of new kitchen in existing cards room. New bar as per plan to allow creation of new Lounge area. In addition to the above, the hut and surrounding area have been upgraded. Prior to 1988 members played socially and competitively against each other but did not compete against other clubs. However, the club decided to enter a team in the Halifax League on Wednesday evenings. The first match was on April 20th 1988. Back then the Halifax Courier gave much fuller reports on games than nowadays and the following, slightly condensed report appeared on the Bowls page on Saturday April 23rd 1988. The team went on to gain promotion to Division Seven finishing champions in their first year. During the Sixties, the Club had around 200 members and a waiting list to join of 6-7 years. In those years the drinking and social elements of the club were a greater feature than they are today. 7pm to 10.30 pm. Most evenings there were at least 30 members having a drink and playing snooker. On Christmas Day the men would come to the club for a lunchtime drink with the President. Wives, however, were invited down on Boxing Day! Ladies Day was held in the clubhouse with Ladies’ bowls and cards in the evening. The Annual Dinner also took place at the clubhouse, when the snooker tables were dismantled and a proper sit down dinner was served by Barkers of Hebden Bridge. Snooker has been a longstanding part of social events at Greenroyd. The two tables currently being used date back to the 1920’s. During the First World War many Greenroyd members fought. 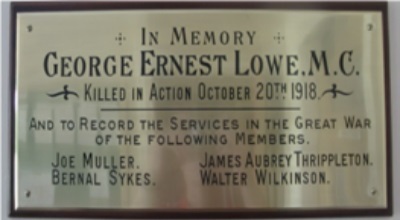 One person of note was Second Lieutenant George Ernest Lowe MC who fought on the Western Front in France. He died aged 34 on 28 October 1918. 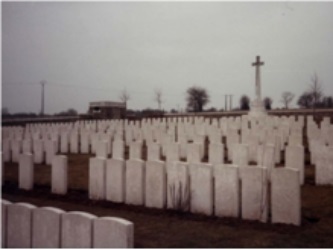 Son of Elias and Grace Lowe, of Halifax and husband of Florence Lowe of 2, Heath Hall, Halifax, he was laid to rest in the Montay-Neuvilly Cemetery in Northern France (below). George died only two weeks before the signing of the Armistice on November 11th 1918. Records show that by 1910 there were 56 members, which by 1917 had risen to 84. In the register of members the occupations reveal a bygone age— skin dealer, coppersmith, confectioner, woollen merchant, draper, cotton manufacturer, commercial traveller. The first reference to bowling with other clubs appears in the minutes of 6th March 1911, when it was agreed “that all ‘friendly games’ with any club be arranged through the Secretary and Committee”…..”and that fixtures be arranged with King Cross as follows—June 1st away, July 13th home, and that the secretary write to The Halifax Club with a view to arranging a fixture with them”. Annual Dinner, which took place at the Pavilion on 10th October 1912. At this time the main winter entertainment was the holding of whist drives. 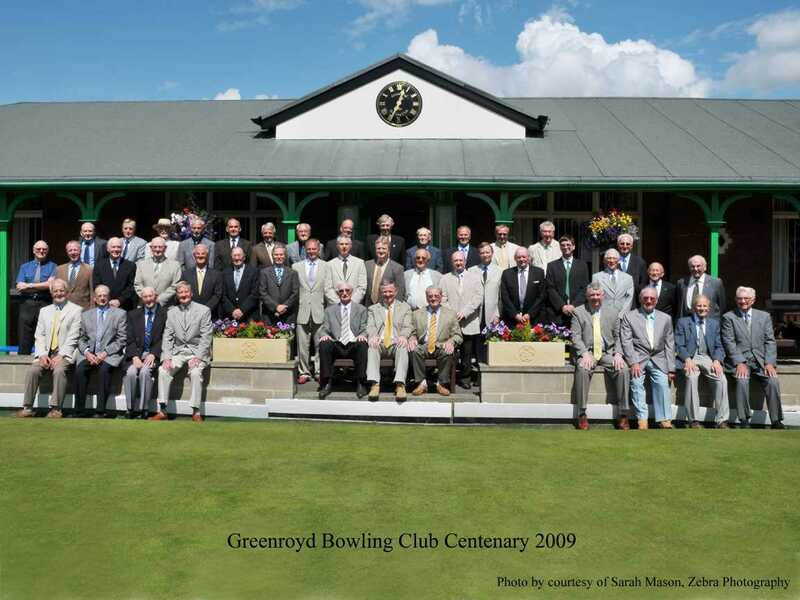 A meeting of ‘interested persons’ took place on 5th January 1909 when it was resolved “that the gentlemen present form themselves into a Club to be called the Greenroyd Bowling Club. It was further resolved “that the Club Pavilion be opened at 9 a.m. and closed at 11 p.m. each day, except Sundays”. 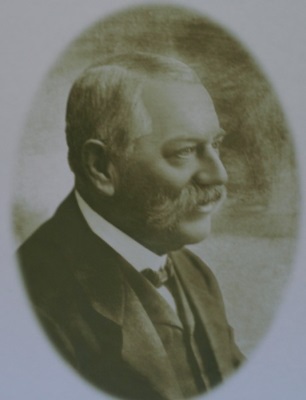 The first General Meeting took place on 18th January 1909, when Mr J Ingham Learoyd was elected as President (a position that he held until 1913). The pavilion was formally opened with a smoking concert on 28th January 1909. The green was officially opened on June 26th 1909 and there was an article in the Evening Courier. On 24th June 1908 the Committee considered tenders for contracting the green. The tender of £125 submitted by Mr J. Parker was accepted. 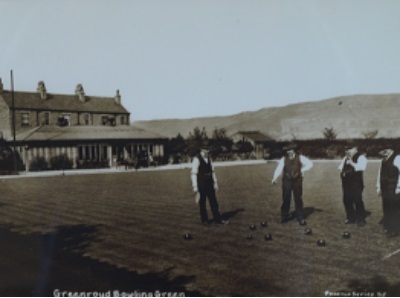 It was further agreed to set up a company with £1,000 of capital and “that in connection with the above company a club be formed to be called Greenroyd Bowling Club; to consist of not more than 100 members, paying an annual subscription of £1.0.0. which will entitle each member to all privileges”. On 11th September 1908 at a meeting of the directors, a tender from Parker Brothers was accepted “to erect a pavilion as good in every respect as the one at Sowerby Bridge, but three feet longer for the sum of ninety-five pounds”. 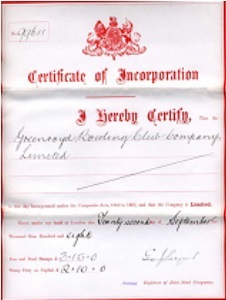 Greenroyd Bowling Club Company Limited was incorporated on 22nd September 1908. At a directors meeting on 30th October 1908 Mr J. Ingham Learoyd (see picture across) was appointed permanent chairman. The History of Greenroyd bowling club was written by Philip Shire and edited by Vaughan Murgatroyd. Greenroyd Bowling Club is available for sponsorship contact David Widdop on 01422 353622 if you have an interest.